Ray Allen has one of the sweetest jump shots in the NBA. He was a vital component of the Boston Celtics first championship since 1986. It turns out he’s also a mensch. I was very surprised to read in the Boston Herald that Allen has visited the United States Holocaust Memorial Museum a number of times and took the Celtics there last week. I’d love to learn more of the background on what prompted Allen to begin visiting the site. I am stunned this morning to learn of the sweeping fraud that investor Bernard Madoff undertook. The Boston Globe does an excellent job of showing the damage Madoff caused here locally. Local institutions, such as the Beth Israel Deaconess Hospital, the Brigham and Women’s Hospital and the Museum of Fine Arts, could all potentially be hurt by Madoff’s deception. It seems that Madoff, a member, until recently, of Yeshiva University’s Board of Trustees, leveraged his connections in the organized Jewish world to target Jewish institutions and family foundations. His victims include Carl and Ruth Shapiro, Avram and Carol Goldberg, the family who ran Stop & Shop, and the Robert I. Lappin Charitable Foundation, which, according to the Globe, “financed trips for Jewish youth to Israel” and subsequently had to close after losing its entire endowment. The paper also catches up with a pair of unlikely victims, New Jersey Senator Frank Lautenberg and the Dean of the Massachusetts School of Law, Lawrence Velvel. When last Gitell.com encountered Velvel, he was hosting a conference at his school in Andover to determine whether President Bush could be prosecuted for war crimes. He sounds like he’s got his ire up about somebody else now. “This is a major disaster for a lot of people…You work all your life, you finally manage to save up something, and somebody who’s entrusted with it, it turns out suddenly he’s a crook.” You’ve got to feel for Velvel. This story has a lot of resonance for me. Back when I worked at the Forward, I was the first reporter to be given the beat of the Jewish philanthropic world. I wrote the first special section on Jewish family foundations and a profile of Yeshiva University. (Here’s the Forward’s report — and the Wall Street Journal’s.) During my time as a lawyer, I worked two buildings down from the “Lipstick Building” on Third Avenue. Throughout all that work, during which I lived in a tiny rent-controlled apartment on the Upper East Side, I observed the rich and the powerful. How immune they seemed from the daily struggles I faced as an energetic but relatively-impoverished Manhattanite on the make. Rather than taking any schadenfreude in the fact that these people can be hurt too, my entire reaction is disgust and revulsion at the pain one man can cause. Now comes a rumor in a strange new light. Several websites make the assertion that Sarah Palin, like John Kerry and Madeleine Albright before her, has hidden Jewish roots. Having said that, I think Bernstein’s Phoenix piece provides some detail as to why the claim is resonating on the right. By the way, it seems to also be circulating among those suspicious of the “Israel Lobby’s” power on the Left as well. I found the contraband signs in the damp grass. They had been rounded up and now lay in two piles by the opening in the chainlink fence where security and campaign officials had screened the 5000 or so people who came to see Sarah Palin speak at Salem High School’s Grant Field this past Wednesday, October 15. It was the third Palin rally in New Hampshire I had attended that day, and I knew that the security guards were keeping out more than just dangerous weapons — campaign staff was also filtering out signs, pins, and shirts that might, to a now highly attuned national audience, appear harsh or offensive. That last phrase comes from chapter four of the Old Testament Book of Esther. Apparently, the idea of Palin as the Queen Esther for our time has made it to New Hampshire. The theory has been around since before John McCain picked Palin in late August — it was circulating on religious Christian blogs in early June when news outlets reported that she was on McCain’s short list. After the announcement, it picked up steam — particularly after it was reported that Palin, at the suggestion of her pastor, had, upon becoming governor of Alaska, patterned herself after Queen Esther. Esther, for those not up on their Old Testament, was a Jewish woman plucked from obscurity to become Queen of Persia after winning a beauty contest. This placed her in the right place, at the right time, to intervene in a plan to annihilate the Jews. In a nutshell, when she revealed herself to be Jewish, the king halted the slaughter and instead hanged Haman, the official behind the plot. Jews recount the tale on Purim with much gaiety and, for most, little concern about historical accuracy. won Miss Congeniality in the Senate,” Palin won that title in the 1984 Miss Alaska contest), now plucked from obscurity to be in a position to advise the powerful should John McCain become president. The big question, of course, is for what vital role — what “time such as this” — is Palin being groomed? One common theory among the Christian cognoscenti is that, just as Esther stopped a threat in Persia to wipe out the Jews, Palin must stop a threat from modern-day Persia — Iran — to wipe out Israel (which would be anathema to conservative Christians, who believe Jews must control that land when Christ returns). Jon Wiener, blogging last month on thenation.com, took note of this suggestion and pointed out that, in the Biblical account, Esther also got the king to grant the Jews the right “to destroy, to slay . . . every people and province that oppress them,” including women and small children. Wiener suggests that, to the Christian fundamentalists, the Book of Esther appears to authorize the bombing of Iran — regardless of civilian casualties. Everyone who lives anywhere near the Arnold Arboretum — a classification that includes everyone in Roslindale — is, or could be, a bird watcher. This isn’t my particular hobby — food is! — but even I’ve marveled at some of the birds I’ve seen outside my window during the last six months — a robin and a blue jay. Rosen is also the editorial director of the fabulous website Nextbook.org, interesting to bibliophiles, philo-semites and Jews alike. I know Rosen from my stint at the Forward, where he edited the cultural pages. That’s how I know Rosen’s bird watching spot is Central Park. Israel’s foreign minister, Tzipi Livni, made the rounds in Boston today. A rising star, she was the subject of a memorable profile in The New York Times Magazine. I caught most of her remarks to a gathering at the Park Plaza organized by the Combined Jewish Philanthropies. She later appeared at the State House and will speak at the Kennedy School later today. Her speech timed to coincide with Israel’s 60th anniversary, the tone of Livni’s remarks was subdued. Israel faces uncertain borders on at least two fronts — Lebanon to the north and Gaza to the south. “Israel is still fighting for its existence,” she said. Much, if not most, of Livni’s speech focused on the renewed negotiations between Israel and the Palestinian Authority, at least the portion of the PA’s Fatah faction that controls the West Bank. Gaza, Livni acknowledged, is run by Hamas, which showers missiles down upon the Israeli cities of Sderot and Ashkelon. 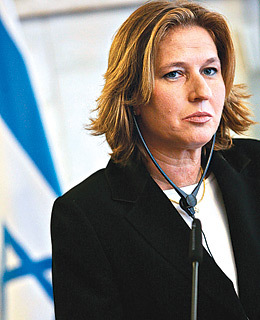 Livni’s central point that the negotiations are necessary for Israel’s survival. “Time is of the essence,” she warned, adding that “more and more changes in the conflict” are coming. Some of the forces that dictate attempting to make a deal now, she said, include anti-Israel sentiment in Europe, Arab League diplomatic action, and potential United Nations resolutions. She went so far as to allude to “international forces” being inserted into the conflict between Israel and the Palestinians. I took that to mean that she fears the international community will attempt to place some kind of international peace-keeping body on Israel’s borders. “Time is not working for us,” she said. Livni also offered a slightly different take on events which followed the failed conclusion of the Oslo discussions between Yasser Arafat and Ehud Barak at Camp David. “Frustration can lead to violence,” Livni said. “We faced an intifada after Camp David.” The general pro-Israeli view has been that Arafat and his cronies launched the violence or allowed it to start to distract from their refusal to make peace with Israel. It was, for example, not frustration that prompted Nabil Shaath, a key Arafat ally, to say as early as 1996, according to a story in the Jerusalem Post, that when negotiations eventually deadlocked, the Palestinians would return to the armed struggle and “all acts of violence” would return. Iran, which I heard so much about during my last reporting trip in Israel, merited very little attention in the organized portion of Livni’s comments. “It needs to be stopped when it comes to its aspiration to have a nuclear weapon,” she said. The job of being both Israel’s chief negotiator with the Palestinians and top diplomat with members of the often hostile world community is not an easy one. She tempered her remarks with realism, even pessimism, in parts. The substance of her comments reflects the indifference and anger Israel faces from the international community, which seems to be grinding Israel’s will down as it approaches its 60th birthday. The strength of Barack Obama’s presidential campaign is his use of sweeping rhetoric that attempts to bring everyone together. Typically, this is best done in general terms, but with little reference to specifics. When Obama was drawn into a specific discussion of the Nation of Islam leader, Louis Farrakhan, he gave an answer that left me cold. “I have some of the strongest support from the Jewish community in my hometown of Chicago and in this presidential campaign. And the reason is because I have been a stalwart friend of Israel’s. I think they are one of our most important allies in the region, and I think that their security is sacrosanct, and that the United States is in a special relationship with them, as is true with my relationship with the Jewish community. So, the first part of an answer calling for him to distance himself from Farrakhan amounts, basically, to a “some of my best friends are Jewish” response. And then he devolves into articulating his campaign’s talking point on Israel. Awkwardly, I might add. I mean, what does Obama mean by continuing to repeat “they?” Israel, Israeli Jews, American Jews? I have no idea. Then, since he’s on the topic of Israel, one might think he might make reference to Israel’s security or the threat Israel faces either from terrorism or enemy nations, such as Iran. But it was bizarre because the primary concern American Jews have about Farrakhan is domestically-based: his record criticizing the Jewish religion and American Jews. Farrakhan’s prominence in the African-American community is relevant to American Jews who live here in this country. Israel is a secondary issue. What is this, the Harvard Law Review? To me, the Farrakhan question called for a straight-forward rejection without this lawyerly “concede the point” business. Despite numerous e-mails from concerned relatives and some hysterical e-mail traffic, I’ve refrained from opining on the questions of Obama and the Jewish community and Obama and Israel. Most of it is way, way out of line. But there’s no question that Obama seems completely out of his comfort zone here, which, coupled with some of his foreign policy advisers, makes me worry about where a President Obama would come down when he is tested in the Middle East. His comments singling out a political party in Israel — again without reference of Israel’s security position– for criticism were also bizarre.